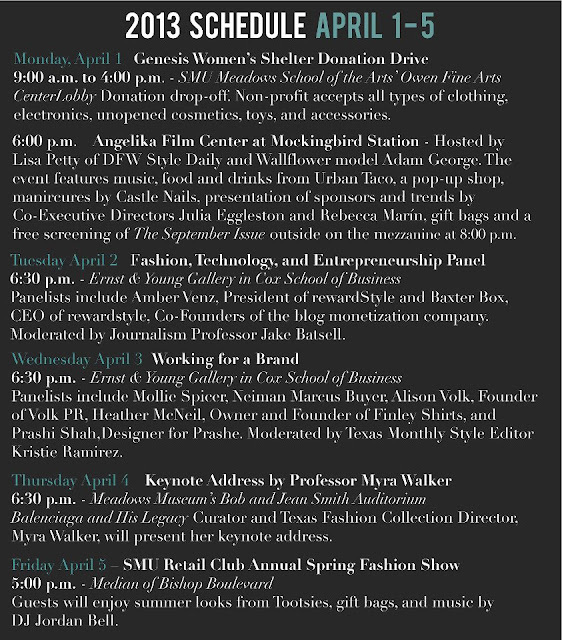 Small 4 Style: It's SMU Fashion Week 2013! It's SMU Fashion Week 2013! Hello SMU Stylistas! Today marks the beginning of SMU Fashion Week 2013, the second annual. I am so excited for the kickoff party, the panels, and the fashion show at the end of the week. Tonight there is a party at Mockingbird Station at 6:00 hosted by my friend Lisa Petty of DFW Style Daily. Stay tuned for coverage of this week's events on Small 4 Style. For more information, visit the event's Facebook page.